Jodhpur is popularly known as the “Blue City” as most of the establishments here are painted in blue. It is a must visit tourist destination of Rajasthan. It was once headquarters of the Rathore Rajput clan. The beautiful city was founded in the 15th century by Rao Jodha, the erstwhile ruler of the Rathore clan Situated on the edge of the Thar Desert; originally it was a part of Marwar. The entire Jodhpur city is divided into four main sections. One is Ratanada housing old establishments and government offices, other is Sardarpur which is a residential area, yet another is the famous Old city lined with bazaars and the last one is Shastri Nagar, with modern houses. 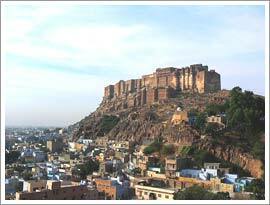 Jodhpur is a leading export center of Rajasthan. Its handicrafts are renowned the world over. Its bazaars are spilled with tie and dye fabrics with silver and golden embroidery, badalas or zinc alloy pictures, wooden toys, leather items, paintings, juttees and silver jewelry, furniture and artifacts. The city of Jodhpur is so arresting that the famous Rudyard Kipling selected it for shooting some of the scenes of his film the Jungle Book. Jodhpur is one of the destinations of the Palace On Wheels, one of the most luxurious trains in the world. It is the second largest city of the state. It is dotted with awesome palaces, stunning havelis, fortified forts and beautiful temples. The huge Meharangarh Fort with several establishments in its complex, incredible Umaid Bhawan Palace (the largest royal residence in the world when it was constructed), Jaswant Thanda and the beautiful Phool Mahal are worth a visit. The colorful fairs and festivals of Jodhpur make the ambiance of the city extremely joyous. Nagaur fair and the Marwar festival are the famed ones. They provide a great opportunity to the tourists to see the culture of Jodhpur from close quarters. Jodhpur is neither too hot in summers nor too cold in winters. The flights from the Jodhpur Airport connect the city with major cities of India. Jodhpur is well connected with Delhi, Kolkota, Mumbai and Chennai by regular trains. Several buses operate in Jodhpur which connects it to all the major cities in Rajasthan.